Cost/Amount: USD$8.00 for 1.2 grams. Sample baggies also available. The on-site descriptions were more flowery and poetic than actually descriptive. The various blog swatches, in different lighting conditions and on different media (some on a primer or base, some foiled, some dry) helped me make my decision more than the color descriptions. There was apparently a contest in the works to get people to submit descriptions for these colors - which I did not take part in, because my descriptions all tend to be very basic and straightforward and I had a feeling that the owner was looking for artistic more than "working" descriptions. When I placed my first order for these colors, the only color that had sold out was Skeleton Key - a nice enough silver-grey sparkle that I nonetheless wasn't intending to get because I already had several greys and silvers, and this one didn't look that remarkably different from the ones I already owned (BE's Sterling Silver, EDM's Silver Spoon.) I wavered on Gaslight Tears, which so many blogs talked up, because I really didn't need another purple. (I ended up getting it anyway.) I also deliberated about Freakshow, because I was concerned that it might be too yellow a brown. When I placed my first order - and three days later, when I placed a "second-passthrough" order right after Aromaleigh v1's closure announcement - the color Infernal Chaos was still an available choice on the dropdown menu. All told, I ordered three jars of that color. Unfortunately, when my first order arrived, instead of two jars of Infernal Chaos there was a handwritten note in the invoice that the color had sold out, and the money had been credited back to my Paypal account. It had indeed been credited back...for both orders...but dang, I was looking forward to that color!! Still, since it was a neutral, there's a better-than-average chance of my finding similar colors in other vendors' collections. The majority of these colors are very, very sparkly. In that, they remind me slightly of the Bete Noire collection. When I was done repotting my colors from this collection, the counter looked like several pixies had sneezed. 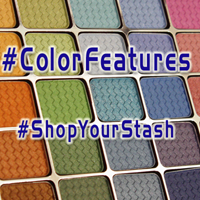 Pigmentation-wise, these are less pigmented than other Aromaleigh collections - especially the stock collections. The colors are pretty, but not as easily substantial.